The American Physical Therapy Association (APTA) define good standing posture as alignment of the ear, shoulder, hip, and ankle from the side. From the back the spine should be straight. 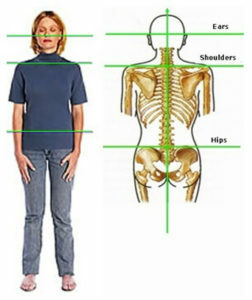 The ears should be level and balanced over the shoulders and the shoulders should be balanced over a level pelvis. 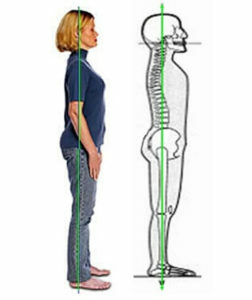 Why is normal posture important? As you know, your nervous system is your master system. Your spine is the suit of armor protecting part of your nervous system, your spinal cord. If you want a healthy body you need a healthy nervous system and if you want a healthy nervous system you therefore need a healthy spine. 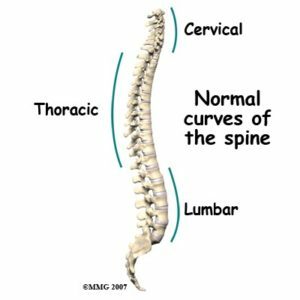 A normal healthy spine from the side is made up of three curves, one on top of the next. The natural shape of the spine is a giant spring. The function of these curves is to act as shock absorbers. If spinal alignment is compromised through poor postural habits, leading to an increase or decrease in the curves. The ability of your spine to effectively absorb shock and protect your nervous system is therefore reduced. The purpose of the chiropractic adjustment is to restore function in the spinal joints. However, this is not enough to maintain good spinal health. You as a patient have the responsibility of breaking your bad postural habits (laying on the couch, on the phone etc) and follow through with strengthening exercises to help hold better spinal alignment for longer (the three legged stool we are always talking about).